In the Dell XPS 13 (9360). Using the latest BIOS 2.2.1 (but the old previous BIOS version was the same). Lock Mode Enable/Secondary = The F1-12 Keys control the secondary functions. These options are Swapped. If you disable the "Fn Lock" and set the mode to "Lock Mode Disable/Standard", log into Windows, and Press F1, it will then MUTE the system. Even though it should act like an "F1" Key. If you go back into BIOS, set the mode to "Lock Mode Enabled/Secondary", log into the system and Press F1, then the Help comes up. The options are swapped on these two configure options. Please update the text in the BIOS to match the appropriate configuration. Thanks. I've included a ScreenShot of the BIOS options. "Fn Lock" does do what it describes (disables Fn-Esc). Doesn't matter if u turn this on or off. If you have it set up as I do below, the Fn Keys are set for the proper Function (F1-F12) operation. However, the text says it should do its secondary functions in this mode. Hello! The BIOS has been updated to version 1.3.4 (from version 1.3.2). Released today. However the text for the "Fn Lock Options" are still incorrect (and swapped). To Test: On a XPS 9360, upgrade to BIOS v1.3.4. Go to "Fn Lock Options", Turn off "Fn Lock" and choose one of the options i.e. "Lock Mode Enabled/Secondary". The description says this should be the secondary functions only, and use Fn to get to the original options. But instead, it's the opposite. Not a big bug... but very confusing for people who use this option to have the description completely swapped for the options they give. Not too sure why it wasn't fixed with the latest BIOS update if it was reported to the right team... since it is a simple copy and paste the description text around... OR swap the function names around... either or. There has been multiple BIOS updates, including a major BIOS version update to v2.2.1. This latest update was released today, Sept 6, 2017. It has been 7 months since this has been reported. And maybe like 5 bios updates since then. Checked the latest BIOS 2.2.1. 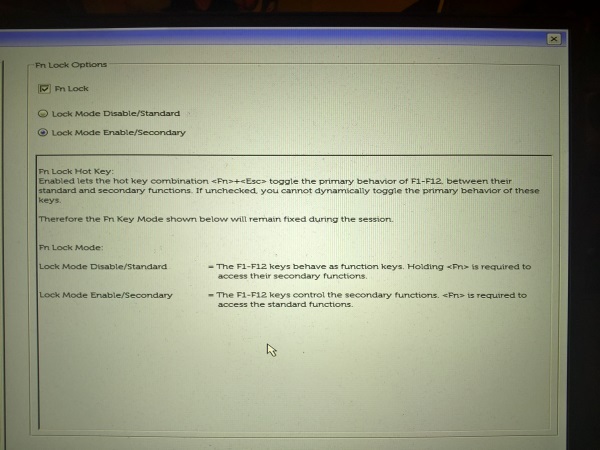 The Fn Lock BIOS Setting is still incorrect. They are swapped. As listed in the initial post. Somone need to swap the text, or swap the options. Either or will work. Basically the First option is actually the 2nd option, and the 2nd option is the 1st.